a Japanese sweet bun filled with red bean paste. There are many types of Anpan, including goma an, shiro an, uguisu an, and kuri an, etc., but the original is anko made with azuki bean. Anpan was first made in 1875, during the Meiji era, by a man called Yasubei Kimura, a samurai who lost his job with the rise of the Imperial Army (made up of conscripts) and the dissolution of the samurai as a social class. The Meiji era was a period in which Japan was becoming increasingly westernized, and many samurai who lost their jobs were given work that was totally new to them. The Western role of baker was one such job. One day, while wandering around the area where many people employed in Western jobs worked, Kimura Yasubei found a young man making breads. Yasubei felt that it was time for Japanese culture to become more Westernised, and so he started a bakery named Bun'eidō (文英堂). In the next year he moved to Ginza and renamed the bakery Kimuraya (木村屋). At that time, however, the only recipe for bread known in Japan was for making a salty and sour tasting bread, ill-suited to Japanese tastes at the time. Yasubei wanted to make a bread that was more to Japanese tastes. Finally, he figured out how to make bread in the way of the Japanese manju -- raising the dough with the traditional sakadane liquid yeast. He then filled the bread with a bean paste (an) and sold anpan as snacks. Anpan was very popular, not only because of its taste, but also because the Japanese were interested in anything new and foreign at this time. Later, a man called Takayuki Yamaoka, a chamberlain of the Meiji emperor, who loved anpan, asked the Tokugawas, the rulers of Japan before the Meiji Period, to present anpans to the emperor when visiting him. So the Tokugawas asked Yasubei to make some for the emperor. Yasubei worked hard to make the anpan and, because he also cared about their appearance, he decorated them with a salt-pickled sakura in the middle of each bun. This anpan was presented to the Meiji emperor on April 4, 1875. The emperor told Yasubei to present him the Anpan everyday, and because of the rumor that the emperor ate anpan, breads, and especially anpan, began spreading around the country. He is famous worldwide and decorates many a lunchbox for children. Anpanman (アンパンマン, Anpanman? ), written by Takashi Yanase, a Japanese writer of children's stories, is one of the most popular anime cartoon series for young children in Japan . It is produced by Nippon Television Network Corporation. Each animated cartoon is approximately 24 minutes long split into 2 episodes of approximately 12 minutes each. 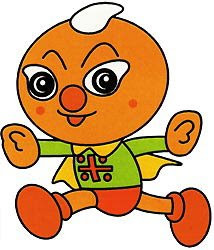 Yanase has been writing Anpanman since 1968. The television series called Soreike! Anpanman (それいけ！アンパンマン, Go! Anpanman) has been on the air in Japan since 1988. As of September 26, 2006, Anpanman's books have collectively sold over 50 million copies in Japan. In 2005, according to research by Bandai, Anpanman is the most popular fictional character from age 0 to 12 years in Japan. He particularly appeals to the younger end of that age group. Heavily merchandised, the Anpanman characters appear on virtually every imaginable children's product, from clothes to video games to toys to snack foods. Yanase became inspired by the idea of Anpanman while struggling to survive as a soldier in World War II. He many times became faced with the prospect of starvation which made him dream about eating a bean-jam filled pastry called Anpan. To promote more eating of rice (kome) in Japan, in Niigata, Tainai Town. The bread is made from rice flour.